There have been 15 captains of the New York Yankees, an American professional baseball franchise also known previously as the New York Highlanders. The position is currently vacant after the most recent captain, Derek Jeter, retired after the 2014 season, after 12 seasons as team captain. Jeter was named as the 11th officially recognized captain of the Yankees in 2003. In baseball, the captain formerly served as the on-field leader of the team, while the manager operated the team from the dugout. Today, the captain is a clubhouse leader. The first captain officially recognized by the Yankees was Hal Chase, who served in the role from 1910 through 1912. Roger Peckinpaugh served as captain from 1914 through 1922, until he was traded to the Boston Red Sox. He was succeeded by Babe Ruth, who was quickly deposed as captain for climbing into the stands to confront a heckler. Everett Scott served as captain from 1922 through 1925. Ten years later, Lou Gehrig was named captain, serving for the remainder of his career. After the death of Gehrig, then manager Joe McCarthy declared that the Yankees would never have another captain. The position remained vacant until team owner George Steinbrenner named Thurman Munson as captain in 1976. Following Munson's death, Graig Nettles served as captain. Willie Randolph and Ron Guidry were named co-captains in 1986. Don Mattingly followed them as captain in 1991, serving until his retirement in 1995. Gehrig, Munson, Guidry, Mattingly and Jeter are the only team captains who spent their entire career with the Yankees. Jeter is the longest tenured captain in franchise history, the 2014 season being his 12th as team captain. There is, however, some controversy over the official list. Howard W. Rosenberg, a baseball historian, found that the official count of Yankees captains failed to include Clark Griffith, the captain from 1903–1905, and Kid Elberfeld, the captain from 1906–1907, while manager Frank Chance may have served as captain in 1913. In addition, right after The New York Times reported Rosenberg's research in 2007, Society for American Baseball Research member Clifford Blau contacted him to say he had found Willie Keeler being called the team's captain in 1908 and 1909, research that Rosenberg has confirmed. 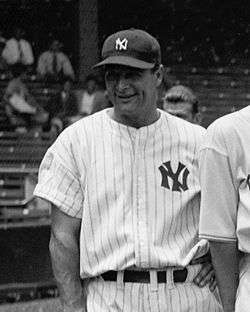 Lou Gehrig served as Yankees captain from 1935 through his retirement in 1939. Names in bold are officially recognized as Captains by the New York Yankees. 1 2 Kepner, Tyler (June 4, 2003). "Baseball: Steinbrenner appoints Jeter captain of the Yankees". The New York Times. Retrieved October 12, 2009. 1 2 3 "Ruth Made Captain; Roth Is Suspended; Babe Chosen to Fill Vacancy Caused by Transfer of Peckinpaugh to Boston. Roth's Ban Is Indefinite; Yankees' Veteran Outfielder Severely Penalized for Violation of Training Rules". New York Times. March 15, 1922. Retrieved November 19, 2009. 1 2 "Many Fans Think Ruth Was Lucky; Majority of Local Baseball Men Call Sentence by Johnson a Light One". The New York Times. May 27, 1922. Retrieved November 19, 2009. ↑ Appel, Marty (2010). Munson: The Life and Death of a Yankee Captain. Random House Digital, Inc. p. 121. ISBN 978-0-7679-2755-0. Retrieved December 5, 2011. 1 2 "Yankees decide upon a captain". Eugene Register-Guard. Associated Press. April 20, 1976. Retrieved November 19, 2009. ↑ Mallozzi, Vincent M. "Author Says Yankees Are Missing Something". The New York Times. Retrieved 2014-10-24. ↑ "Toledo Signs Hartzell; Former Yankee Captain to Cover Third Bag for American Team". The New York Times. December 27, 1916. Retrieved November 25, 2011. ↑ Mallozzi. "Author Says Yankees Are Missing Something". The New York Times. Retrieved 2014-10-24. ↑ e-mails from Clifford Blau to Howard W. Rosenberg, March 25, 2007 and March 29, 2007, citing the New York Tribune of April 28, 1908, New York Evening Telegram of June 17, 1909, and Sporting Life of April 24, 1909. ↑ "Hal Chase Exonerated. ; Ban Johnson Decides Yankees' Captain Was Not Disloyal to Team". The New York Times. September 24, 1910. Retrieved November 25, 2011. ↑ "Ruth Regrets Action; Resents Fans' Stand; Declares New York Rooters Have Not Given Him 'Square Deal' Since Return" (PDF). The New York Times. May 27, 1922. Retrieved November 19, 2009. ↑ "Nettles Yanks' Captain". Ocala Star-Banner. Associated Press. January 30, 1982. Retrieved November 19, 2009. 1 2 Vecsey, George (April 12, 1986). "New Co-Captain: It's Randolph". Wilmington Morning Star. Retrieved November 19, 2009. ↑ Martinez, Michael (March 1, 1991). "Baseball; Mattingly Is Named Captain; Will He Go Down With Ship?". New York Times. Retrieved November 19, 2009. Rosenberg, Howard W. (June 9, 2003). "Derek Jeter Isn't New York Yankees' 11th Captain" (Press release). Howard W. Rosenberg Books. Retrieved May 20, 2007. "New York Yankees captains". Baseball Almanac. Retrieved February 27, 2012.